Not everything in the Bible is Biblical! I love The Princess Bride. (Like everyone, right?) This 1987 film is a near-perfect blend of fantasy, romance, and our universal desire for justice framed with sarcasm and a constant flow of quotable lines. Vizinni declared something inconceivable when it violated his plans. In his self-confidence-drunk imagination, it was inconceivable that someone could be more clever, stronger or even luckier than he had accounted for. The word “inconceivable” was his protest when reality challenged his view of himself and the world. There is a word with this same sort of problem used all the time in the modern Christian church. This word seems innocent enough, yet most every time it’s used it is a distraction, a cover-up, sometimes even an intentional manipulation. It’s a word that seems simple enough, with a self-evident definition, and yet that assumption is the problem. Most of the time when the word is used, the word does not mean what we think it means. At first glance, the word seems simple, obvious, even helpful. So, why is this word problematic? Which “Biblical” are you using? The first and most difficult problem is that not everything that’s Biblical is, well… Biblical. The way the word is used, it most often means that a certain idea or behavior is in alignment with God’s will as taught in the Bible. Is an idea orthodox? Is an action acceptable? That’s a useful sort of shorthand, except that there are loads of ideas and activities recorded in the Bible that are not Biblical in this sense. For example, the Levite in Judges 19 was so upset about the immoral behavior of the tribes of Israel, that he butchered a concubine of his, cutting her body into pieces, and shipped those pieces around the country as a protest against ungodly behavior. So, this episode is in the Bible. It features a spiritual leader being moved to stand against ungodly behavior in his culture. That’s good, right? But his chosen action is horrific! I can’t imagine anyone arguing that his choice would align with Jesus’ teaching! It also seems a pretty far stretch to say this lines up with the character of God, if you consider the whole scripture. I think it’s a travesty to call this action Biblical in the sense of aligning with God’s revealed will regarding belief and action. Yet the word is used in this way all the time on less obvious issues. Most Christian churches teach that tithing is Biblical. Tithing is in the Bible. That’s true. The New Testament, however, frames giving in a much different way from the Old Testament. Old Testament giving is framed in terms of sacrifice and duty, measured in specific percentages. New Testament giving is framed in terms of stewardship. Everything a Christian owns belongs to God (100%!) and is meant to be used in keeping with God’s purposes for both the individual and the church. That means a 10% tithe is Biblical if you mean it’s recorded in the Bible and was prescriptive for a certain group of people at a certain time. But it’s probably not Biblical if you mean that it is binding on God’s people today, fully in alignment with God’s will regarding belief and action. Are you wanting a simpler answer than the one you got? The second problem with the world “Biblical” is that it implies a uniformity that’s not always present in scripture. When someone claims that something is Biblical, it sounds like there is a single, uniform teaching on the topic. But hear me: There is no comprehensive statement about what a Godly marriage looks like in the Bible. There is no “Book of Marriage,” no convenient FAQ that details God’s expectations for the ideal marriage relationship. There are marriages in the Bible that were economic. Others that were political. There are marriages in the Bible that included multiple women, and these marriages pass in the narrative without Divine critique. There are rules laid out in the Mosaic law pertaining to marriage that would be considered horrifying today, such as the command that if a man rapes a virgin in a field, his consequence is that he is required to marry her, and he can’t divorce her, ever! We do get two short teachings on marriage from Jesus in Matthew 5 and 19 that make it clear that divorce isn’t part of God’s intention for us. There’s an intriguing argument in Matthew 22 that suggests there won’t be marriage in heaven like we know it now. Paul, who was never married as far as we know, also mentions marriage in two places. In 1st Corinthians 7 he talks about a variety of marriage situations, making a clear admission that all of this is a “concession” because he’d much rather we avoid getting married, if we can help it. He mentions marriage again in the household codes of Ephesians 5 with a few brief instructions for husbands and wives, but this passage is arguably about our relationship with Christ, as much as it is about the mechanics of marital relationships. The Levirite marriage law says that if my brother dies childless, it’s my responsibility to marry his wife (even if I’m already married) and get her pregnant, so that my brother will still have an heir. If “Biblical” means “it’s in the Bible,” then that’s a Biblical marriage, but I know of no modern church that would support or officiate such a marriage. Why? Because that kind of marriage violates not only the law of the land, but a higher standard that we see in scripture. (Not to mention the views of my wife!) It could be argued that if attempted today, a Leverite Marriage would run counter to a “Biblical marriage,” if by that we mean a marriage in alignment with our best understanding of God’s will for relationships in scripture. I don’t disagree that a study of scripture can lead you to a picture of marriage that is aligned with God’s will. My only point is that this stuff is just not as cut and dried as we’re often told. Are you trying to gloss up your bashing stick? The third problem is that this word is often used to extend a broad umbrella of authority to passages that might only be minority voices in scripture, or perhaps to make certain instructions that were given in a specific context to specific people seem universally applicable. To say something is “Biblical” implies that there is wide, uniform, and continuing support for an idea in scripture. And yet, the truth might be that the concept being discussed is represented only in a handful of verses, and perhaps not even in a prescriptive manner. A great exmaple of this is Tattoos. Tattoos are mentioned exactly once in the Bible. In the Mosaic law they are forbidden. No question. On that basis it’s not uncommon for people to criticize tattoos as unbiblical. Yet, when you read the Mosaic law, this injunction against tattoos is clearly inside the context of protecting Israel from the practice of foreign religions. It was a law given to Israel prior to the Temple system, as one tool to innocculate them from the idolatrous practices of the local religions around them. There is no indication that this was a law meant to extend beyond Israel. So, while there is a single, specific proscription against tattoos, it’s arguable that this proscription is not an eternal, binding injunction. It’s Biblical in that it’s in the Bible, and was at one point binding. But does it remain Biblical today, in the sense that it is the current expression of God’s will for all people everywhere? That is a fair question. Taking the easy way out? Finally, and most importantly, this word is a short-cut, a way of cutting corners on the important work of learning and understanding scripture. To say that something is “Biblical” allows us to skip out on the hard and fruitful effort of reading, understanding, and applying the Bible ourselves. We often let a preacher or theologian tell us the final word on what is Biblical. If a verse and chapter can be cited, we trust that something is Biblical. But the Bible is not a reference manual or a law code laid out in convenient sections discussing everything that pertains to a topic in one spot. There are all kinds of things in the Bible that are there for reasons besides telling us how to live or what to think. There are histories that record the lives and actions of people. In many cases those examples aren’t there to guide us primarily. They are there to give context to the larger story the Bible is telling. There are rules in the Bible, clearly declared by God. Yet some of those rules were for specific people in specifical places and circumstances. For example, people who were healed from leprosy were supposed to present themselves to the priests for examination. Jesus even affirms this. That’s in the Bible, but is this rule meant to be a universal rule for all people at all times? We certainly don’t act like it is. Church elders are not going around inspecting peoples moles. Christians who’ve gotten their psoriasis under control are not seeking out Orthodox Jewish Rabbis to get clearance to return to the community. Sound absurd? Maybe so. But be clear: Even if we claim that this was originally a public health ordinance that no longer applies because of different technology and sanitation, we have to admit that we are making a choice that a clear command in scripture is no longer valid. The truth is that the word “Biblical” is very nearly meaningless because the meanings we’ve assigned it are so squishy. Don’t panic. We can still love and trust the Bible. Deciding to let go of the word Biblical doesn’t mean we no longer believe that God has revealed truth in scripture. It doesn’t mean that we’re relativists. It doesn’t mean that we don’t believe in inspiration. 1. We recognize that the Bible isn’t a single book, but a library of books, and those various books, with their different authors, contexts, and content, don’t all address the same topics in exactly the same way. 2. We recognize that the books within the Bible document God’s interaction with people across a long range of time and a variety of different cultures. This isn’t a problem. It’s part of the process of inspiration. For us to hear the words of scripture rightly, we need to take this into consideration. After all, if we believe that God chose to inspire the words of scripture, then it’s also true that God chose a specific time and place to inspire those words. The context is part of the inspiration. 3. We recognize that because the books of scripture document God’s interaction with people across time, that there are certain topics where God’s actions or will on a certain subject evolve. Not because God has changed. Not because God’s eternal principles have changed. No! Simply because God condescends to work with people in their own cultures where they are at. This is what grace does. It meets us where we are and takes us beyond to a place we couldn’t have gotten to on our own. 4. We recognize because these things are true, that reading the Bible requires a more careful and nuanced practice of discernment, allowing the Holy Spirit to guide us. If we believe that these 4 things are true, then we can’t simply take the fact that a topic exists in scripture as evidence that it is the full, complete revelation of God’s will on the subject. That means that saying something is “Biblical” is often an unhelpful over-simplification. So, what should we say instead? All of these ways of referencing scripture are more specific and more honest than saying something is simply Biblical. They also don’t carry the additional baggage of implying that what we’re saying is the final, universal, and complete teaching on the subject. If we mean to say that a particular point of theology is the right, best, or highest view on the subject, we need to be honest and say that. When we say that a particular view is “Biblical,” we are making a power claim against any other views. For example, It’s not uncommon to hear someone say, “5 Point Calvinism is Biblical.” What they usually mean is that 5-point calvinism is, in their view, the correct interpretation of scripture. But to simply say “5-Point Calvinism is Biblical” isn’t accurate or honest. To say, “In my reading of scripture, 5-Point Calvinism is the best theolgical framework for making sense of God’s soveriegnty in the world” is much more accurate. To say, “I think 5-Point Calvinism is more in alignment with Paul’s teachings than Arminianism,” is more honest. But saying the Bible teaches 5-point calvinism is just not accurate. There is no chapter and verse that lays out the “TULIP” model. This is a construct, one way of making sense of a variety of passages. You may think it’s the best way, but it’s not the only way–and intelligent, faithful, Godly Christians for the past 2000 years have seen it differently. If we mean to say that a particular behavior is good, right or Godly, we need to just say that. Don’t say, “I believe in Biblical marriage.” Say, “I believe that the book of Genesis teaches that marriage is between a man and a woman, and I believe that teaching was proscriptive for all people at all times.” Why say this? Because this is more accurate and more honest. It also makes clear that while there are lots of other kinds of marriages represented in the Bible, you do not take those models of marriage to be prescriptive. Now, I’m nobody special, and my thoughts on this are likely not going to change a perasive culture, but it seems like a helpful conversation for the Church to have. After all, if we can’t get more accurate and honest in our langauge, there are consequences. When we tell our children something is “Biblical,” but later when they study for themselves they learn that the text is more nuanced and multi-faceted than we represented, they will begin to doubt our trustworthiness. When we declare to the culture that a certain behavior is unbiblical, and then they go to the text for themselves and discover that other behaviors proscribed in the same passages are widely ignored by us, they will accuse us of ignoring or being ignorant of our own sacred text. And they would be right. When leaders make a practice of laying out lists of what is Biblical and what isn’t, we train the people we lead to depend on our guidance and explanation, rather than going to the text to learn for themselves. Instead of becoming Christ’s disciples, they become our disciples. These things matter. The weaken us as a people, and they undermine our relationship with the world around us. Don’t use the word “Biblical” as a lazy excuse for not looking up a scripture reference. Don’t use the word “Biblical” as a way to buttress your argument without actually showing your references and why you think those references support your view. Don’t use the word “Biblical” to shut down discussion. Don’t use the word “Biblical” as a way to justify behavior that you like, that you’re comfortable with, or that you prefer. Remember, if you use the word “Biblical” to mean “in alignment with God’s revealed will,” there are lots of things that are in the Bible, that most interpreters don’t think are positive, Godly, or binding on Christians today. Just because something is in the Bible doesn’t mean it’s Biblical. 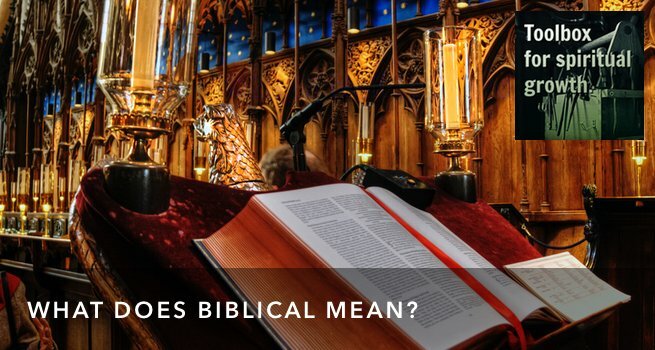 Reflect on how you have used the word, “Biblical.” When you use it, what exactly do you mean? Why do you think the word “Biblical” is helpful? Why do you think it’s unhelpful?